Lee Taylor, a Californian boat racer, had first tried for the record in April 1964. His boat Hustler was similar in design to Bluebird K7, being a jet hydroplane. During a test run on Lake Havasu, Taylor was unable to shut down the jet and crashed into the lakeside at over 100 mph (200 km/h). Hustler was wrecked and Taylor was severely injured. He spent the following years recuperating, and rebuilding his boat. On 30 June 1967, on Lake Guntersville, Taylor and Hustler tried for the record, but the wake of some spectators' boats disturbed the water, forcing Taylor to slow down his second run, and he came up 3.2 km/h (2 mph) short. He tried again later the same day and succeeded in setting a new record of 459 km/h (286.875 mph). Lee Taylor tried to get the record back in 1980. 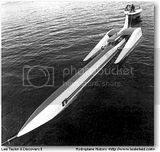 Inspired by the land speed record cars Blue Flame and Budweiser Rocket, Taylor built a rocket-powered boat, Discovery II. The 40-foot (12 m) long craft was a reverse three-point design, similar to John Cobb's Crusader, albeit of much greater length. Originally Taylor tested the boat on Walker Lake in Nevada but his backers demanded a more accessible location, so Taylor switched to Lake Tahoe. An attempt was set for 13 November 1980, but when conditions on the lake proved unfavourable, Taylor decided against trying for the record. Not wanting to disappoint the assembled spectators and media, he decided to do a test run instead. At 432 km/h (270 mph) Discovery II started to become unstable. It has been speculated that it may have hit a swell. Whatever the cause, the boat's unstable lateral oscillations caused the left float to collapse, sending the boat plunging into the water. The cockpit section with Taylor's body was recovered three days later. The cockpit had not floated as intended and Taylor drowned as a result. This is the only known video of the lee taylor hustler jet boat record. June 1967. 285.213 MPH. Taken by Rich Halletts wife Willetta. Super 8 (no sound). The record was set at Lake Guntersville in Guntersville Alabama. The other short film is a inboard circle race at Cullaby Lake in Astoria Oregon. Lee Taylor's Hustler used in his 1968 record setting speed run. Since last month's feature on the Lee Taylor/Harvey Aluminum jet boat, the Hustler, in HOT ROD, several test runs have been made with both good and bad results. The last test was conducted in mid-April at Lake Havasu City, Arizona, on the Colorado River. The first run was made down the river at about 125 mph to check out the machine. After being towed back, driver Lee Taylor decided to make a slow run downriver, then make a quick run back; 150 to 200 mph was scheduled for the 4- to 4½-mile course. With an Army helicopter hovering overhead to observe, Lee eased open the throttle. The big boat ran straight and true, skimming over the water supported by an air cushion, as was intended. At mid-course, the boat was still accelerating and traveling well over 250 mph. At this point, no one knows what happened. Conservatively, the boat was traveling very close to 300 mph when Lee chopped the throttle. He had apparently misjudged his speed, or the distance the air-riding hull required to slow down and re-enter the water. At about 100 mph, Lee ran out of water. A rocky point, jutting out of the water about 100 yards from the shore to which the Hustler was headed, tore up the boat's left sponson and threw Lee clear of the boat into rockfilled shallows. The boat continued on the beach and came to rest about 25 or 30 feet up a 20-degree incline. The boat did not suffer extensive damage, except for the ripped sponson, but Lee was badly knocked about in the rocks and sustained many injuries. He is, fortunately, well on the road to recovery. Harvey Aluminum personnel are convinced that the boat is right, and if all's well and in agreement with Lee, an attempt will be made to bring the world's water speed record back to the United States.